We supply a large range of hydraulic filters manufactured by GUD, Fram, Baldwin, Fleetguard, Donaldson, Rovos, MANN-FILTER, Luber-Finer and Racor by Parker. Spin-on filters are a complete product range suitable for both suction and return applications. Utilising spin-on canisters, they are quick and easy to service and provide a clean solution when changing elements. The filter elements are either resin-impregnated paper, glass fibre or square wire mesh and are specifically designed for contamination control in hydraulic and lubrication circuits for mobile applications, agricultural and machine tool systems. 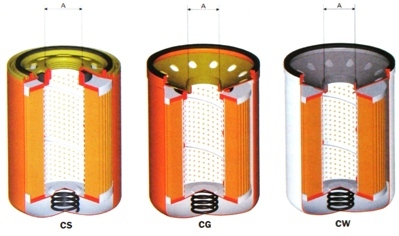 These canister filters remove water from oil while filtering the oil at the same time. Water absorbent polymers up to 800 times their weight, provide this major feature. Suction filters are designed for reservoir sidewall applications. This completely new design of filter allows the filter element to be replaced without having to drain the oil from the reservoir. These filters are supplied complete with bypass valve and are particularly suitable for power pack, mobile, construction and industrial machinery applications. These strainers are suitable for use in the suction line, submerged in the reservoir. They are available for nominal flows up to 900 l/min (with oil at 30 mm²/s). These filters are particularly suitable for applications where it is necessary to protect pumps from coarse particles of contamination. They are available with or without a bypass valve, a safety tie rod and are supplied with an internal magnet column.